So how did I get into cake decorating? I didn't start decorating cakes until after my son was born. Never even thought it was something I wanted to do, or would be good at. So for me, there was definitely a defining moment for when I "started" decorating cakes. While I've always enjoyed baking and been pretty good at it, cake decorating was nowhere on my radar. Not until I offered to make my mother-in-law's birthday cake for her 60th birthday. We were having a surprise party for her... I really wanted to make the cake special, but wasn't sure exactly how. 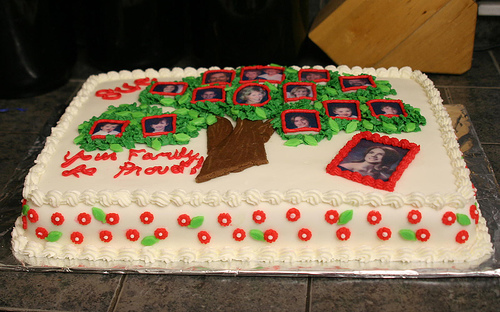 I had ordered cakes from the grocery store with edible images before for my kids' birthdays. 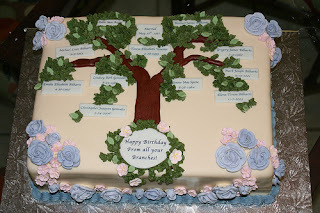 That gave me the idea to put a "family tree" on top of the cake to high light her life and the people in it who loved her. I thought it would be cool to have photos of the family on the family tree and one larger photo of Sue on the cake. But how on earth was I going to execute this idea? I had no skills whatsoever at icing a cake smooth. So then I had this brilliant (albeit somewhat naive) idea of making fondant. I really didn't know that much about it and wasn't even sure if I had the name right. But I thought, if I had a perfectly smooth cake to decorate, that would be a great foundation for the family tree. I did a google search and found a recipe for marshmallow fondant. I figured if it didn't work out, I wasn't out that much money or time so I thought I'd give it a shot. So I followed the recipe (which called for incorporating the sugar into the melted marshmallows by hand). I had the biggest mess on my counters and swear I was up to my elbows in confectioners sugar and melted marshmallow. I'm sure the amount I washed off my hands was nearly equivalent to the amount of fondant I ended up working with. All the stars must have aligned just right because somehow.... somehow!.... that fondant rolled out so perfectly.... it went onto the cake perfectly! It felt like a miracle, and I was sooooo pleased. I had this beautifully covered, perfectly smooth, white sheet cake upon which to decorate. I was scared to death to decorate this cake... I mean... it was beautifully flawless (in my mind anyhow)... I was so afraid I would muck it up when I started adding decorations. So I made my decorations out of fondant... hand rolled and cut chocolate fondant for tree trunk and limbs... green fondant cutout leaves... red fondant cut out flowers.... I was mesmerized by this lovely concoction that was so wonderfully pliable... I became addicted and obsessed with the product and the limitless possibilities it represented. The flowers and leaves were all looking pretty spectacular in my mind, but I was so afraid to actually put them on the cake. Finally, I mustered up the courage to start adding the decorations to the cake... little by little, step by step, my confidence grew. I made green buttercream and piped some additional leaves. 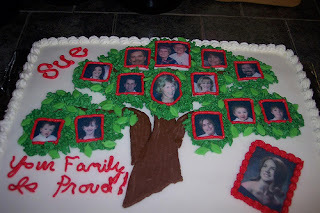 I made red buttercream for additional piping to frame the family photos. I was on fire! Or at least that is how I felt. As is plainly evident, piping/writing was my downfall. I was sorely disappointed in the "Your Family Is Proud" script that certainly looked like a four year old wrote it. It started there and never stopped. That was December of 2006 and I never looked back. I went to culinary school in 2008 and completed a Pastry Arts program. This single cake was a catalyst to a hobby, which has blossomed into a successful cake business that keeps me pretty busy... and I wouldn't have it any other way. I am proud to say that my piping skills have improved tremendously over the years and no longer look like the work of a pre-schooler! Fast Forward to October of 2008.... This was my next "Family Tree" cake.... Makes me think of that Virginia Slims (?) ad... "You've Come a Long Way Baby!" It was nice to recreate the same "idea" for a cake and see just how far I had come... Absolutely LOVE both cakes, but for completely different reasons. Trying to figure it out, but haven't found anything yet on my end. I'll keep looking. Thanks for letting me know! it, you're a great author. I will be sure to bookmark your blog and will come back at some point. I want to encourage you to ultimately continue your great posts, have a nice weekend! here "The Cake That Started it All". I do have 2 questions for you if you do not mind. Could it be just me or do some of these remarks look like they are written by brain dead visitors? :-P And, if you are writing at additional online sites, I'd like to keep up with anything fresh you have to post. Would you make a list of every one of your public pages like your Facebook page, twitter feed, or linkedin profile? We're a group of volunteers and opening a new scheme in our community. Your site offered us with valuable info to work on. You have done an impressive job and our entire community will be thankful to you. a blog. I saved as a favorite it to my bookmark webpage list and will be checking back soon. Chrome. Do you have any suggestions to help fix this problem? Here is the solution http://sharecashdownloader.uni. I constantly spent my half an hour to read this webpage's content everyday along with a mug of coffee.